Although 14 days seems like a lot of time to cross the country, the trip often felt rather rushed - we even put in one 12-hour driving day! One reason for the long days is that we made it a priority to stop at the national parks along our route - Painted Hills, Arches, Canyonlands, Mesa Verde and Carlsbad Caverns. Though they added hours to our driving time, every one of the parks was worth the visit. (They were also a steal - $10 entry per car at most parks, $10/person at Carlsbad... and Painted Hills was free!) Next time you hit the road, be sure to plan some National Park stops along the way! We based ourselves in Moab, Utah for two nights so that we could visit both Arches and Canyonlands. Moab is just a few miles from Arches, so after setting up camp we headed back out at 5pm to enjoy Arches during the cooler evening hours. We stopped to chat with a ranger at the Visitor's Center and she outlined a route that we could do during the 3 hours we had until sunset. It was ambitious, but it hit all the high points and I was determined to make it happen! We drove all the way through the park to get to our first stop, a 1.5-mile hike to Landscape Arch. The formations at Arches are constantly changing, due to erosion and weathering. One reason we particularly wanted to see Landscape Arch is that the ranger told us that it might not be around much longer. In 1991, a 60-foot slab fell from the underside, leaving behind a much thinner arch that could last a hundred years, or fall tomorrow. A small deer friend along the path. We jogged back to the trailhead and hopped in the car to head to our next stop, Delicate Arch, as clouds started to move across the sky. Delicate Arch is one of the more well-known arches in the park. You can hike out to the arch itself, but since we were limited on time we decided just to do a quick hike to a viewpoint. From there we had a great distant view of the arch and the long line of people waiting in line to get their picture taken under it, even as thunder boomed in the distance. 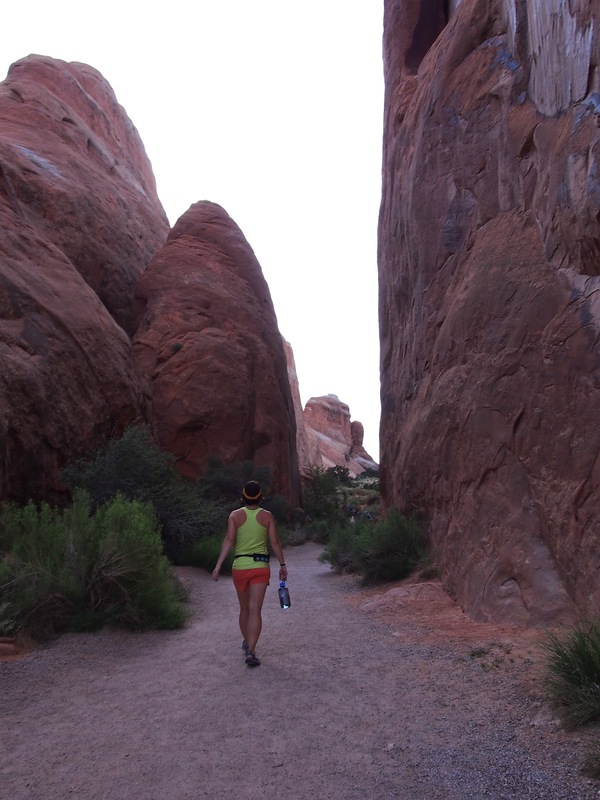 We ran back down the trail again, glad that we hadn't joined the crowds under the arch. The people you can see under the arch are just the beginning - there was a long line off to the left of the photograph. We were now in a race against both the sunset and the thunderstorm that was approaching. As Cat drove towards our final stop, the Windows, I frantically tried to figure out what settings to use on my camera to get any chance at a lightning shot. It took a lot of empty frames, but I think they were worth it for the couple of shots I got! The Windows Section is known for being a great sunset spot, and there was a sizable crowd gathered. I jumped out of the car and spent several minutes joining the hoards of people moving back and forth between shooting the sunset straight ahead of us and shooting the storm to our right. It was pretty unreal. No filter, no editing needed - this sunset was naturally perfect. We realized quickly that time was running out, and once again we jogged up the trail (we really got our workout in!) to the North Window. The wind had picked up, lightning was flashing in the distance and the sun was now below the horizon. I yelled over the wind to Cat that we needed to get back to the car - and quick! - and took off down the hill on my own while she soaked in the scene for a few moments more. She caught up to me on the trail and we sprinted down with the first fat raindrops falling around us. The sky opened up right as we hit the parking lot. It was one of those moments that makes you feel just so incredibly ALIVE and so grateful to be in that place at that time. The drive out of the park was in total darkness except for the headlights of all of the cars like ants winding through the mountains ahead of us, and the lightning that continued to flash all around us - it was July 4th, so we joked about nature's fireworks show being better than anything man-made ever could be. I started to try to take more pictures, but decided to stop and simply enjoy the spectacle without a camera lens in the way. No picture of mine could have captured the electricity in the air and the joy and exhilaration we felt in that moment. Our enthusiasm dampened slightly when we returned to Moab in the pouring rain and realized that our tent, set up on a sandy lot, hadn't had one corner of the rain fly secured. It was wet and sandy inside our abode as the storms continued throughout the night... but in the end, that's just part of the experience. Next up: Canyonlands and Carlsbad Caverns.